As night fell on the evening of January 24, 1865, Flag Officer John Mitchell eyed the river barrier across the James at Trent’s Reach. His James River Squadron had failed to cross the barrier the night before due to many ships running aground before even making the attempt. He was determined to give it another try on the night of January 24-25, 1865, 150 years ago today. As the Confederates again got underway after dark, trouble arose immediately. Mitchell’s flagship Virginia II, which had taken several hits from Federal ironclad Onondaga and had suffered under the Union guns situated in the surrounding land fortifications the day before, was found to have multiple holes in her smokestack. This led to a heavy later of smoke blinding the pilots of the vessel. They refused to go any closer to the obstructions. In addition, the Confederates found the unwelcome addition of a Union spotlight shining into the James to light the area for Union batteries during the night. At this, Mitchell called all of his commanders aboard his flagship for a council of war. They agreed that it was useless to go on, and the last ditch Confederate attempt against City Point was truly finished. But this wasn’t the end of the James River Squadron’s ordeal. They still had to steam from Trent’s Reach back upriver past the looming guns of Fort Brady and to their anchorage near Chaffin’s Bluff. 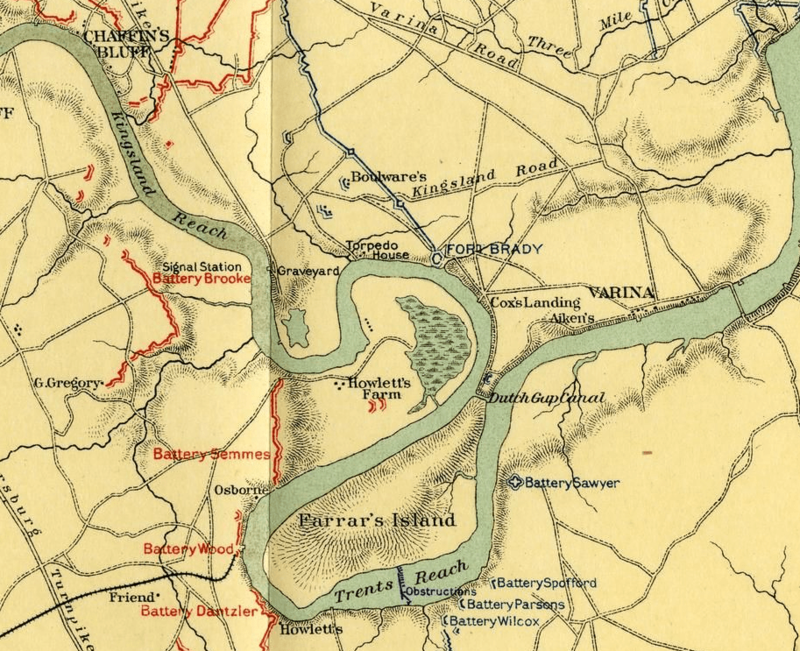 As January 24th turned into January 25th, the Confederates made their way slowly back upriver, their highest speed downriver unmatched due to the current. As the Confederates passed by Fort Brady in the growing light and headed upriver, the big Union guns opened on the Southern ships. Virginia II was tough to steer with the smokescreen her pilots faced, and actually ran aground while under fire from the Federal fort. However, she was soon off again, and all of the ships passed upriver to safety without any further adventures. This second Confederate attempt was probably doomed even if they had proceeded through the barrier successfully. The Federals had been alerted, U. S. Grant was on the scene and actively involved, and more Union ironclads were on their way. The better shot had been the previous night of January 23-24. John Coski believes the Confederates could have proceeded with just Fredericksburg and Hampton, but he also called their chances an “illusion of hope” as far as reaching City Point. The Onondaga by herself was just too powerful a ship. In any case, Mitchell lost his position about a month later for this failure. The Confederates would never again have a golden opportunity to make the run to City Point, and Mitchell’s delays in actually making the attempt and then in failing to push boldly ahead through adversity cost him his job.